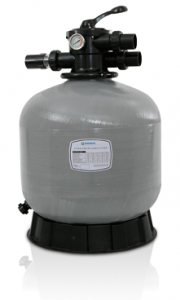 Zodiac Titan Series Fibreglass Sand Pool Filters have been specifically designed for Australian Conditions. Highly efficient, the Titan Series Fibreglass Sand Pool Filters are suitable for small to large residential pools. The body of the unit consists of two layers. The inner tank is made from food grade polyethylene and the external tank from strong woven fibreglass to extend the life of the filter. Features an ergonomic palm shape handle for easy operation. Large signt indicator glass for clear backwash inspection. Oil filled pressure gauge for easy inspection of operating pressure. Quality inspected and factory pressure tested at 400kpa (NB: Maximum working pressure 250kpa).